July | 2007 | Ipoh Mali Talak Sombong! First and foremost, I would like to express my deepest gratitude to Mr and Mrs. Jeannie Lee, for inviting us the floggers over to their New Formosa Restaurant for a scrumptious meal. Not forget to mention CityGal who acts as the organiser for that night too. 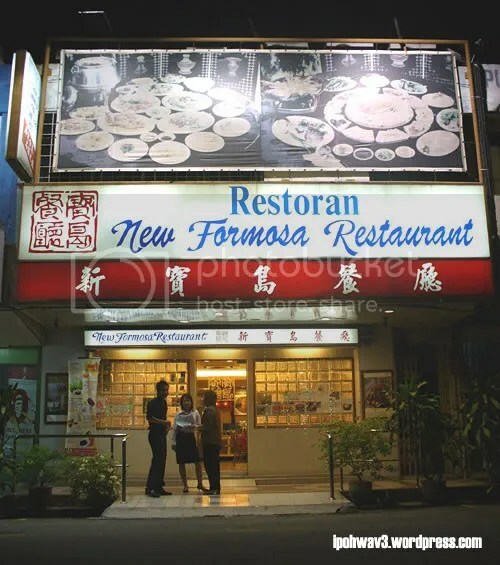 For the past 27 years, New Formosa Restaurant has been introducing a wide array of authentic and delicious Taiwanese delicacies to our fellow Malaysian which cannot be found elsewhere. WMW and I arrived slightly late that day but lucky for us, dinner haven’t been served yet. The eleven of us which include Boo_licious, CityGal, Lianne, Mark, Jackson, Xiu Long Bao, Pam, Tankiasu and Joe were later greeted by the friendly Mrs. Jeannie Lee and without any delay, we were presented with the menu and two types of refreshing drinks, Sour Plum Juice and Homemade Herbal Tea. Our eyes were practically bulged out after we read the menu… The dinner comprises of one Formosa Suckling Pig Set Meal, one Bonito-Ma La Steamboat, one Formosan Stone-fire Pot meal and four types of desserts! Let’s start with the Formosa Suckling Pig Set Meal: 1. 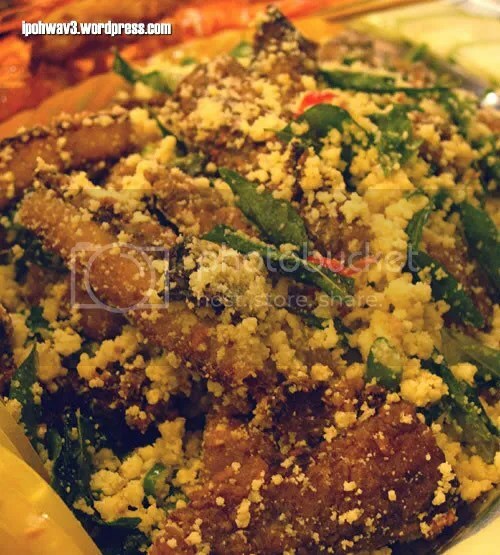 Formosa Special Combination Dish. 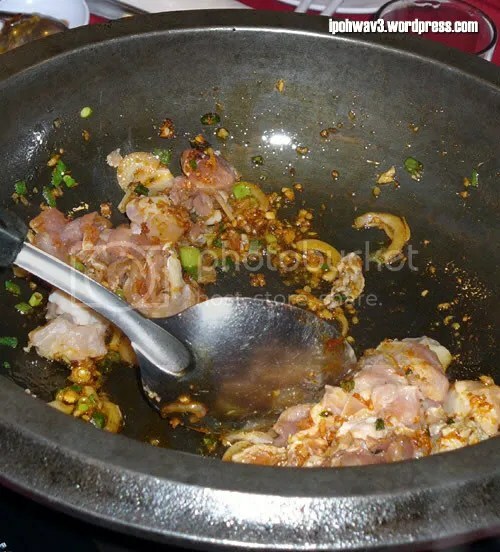 A platter of four different dishes were presented before us which consists of Sesame Pig’s Intestines. 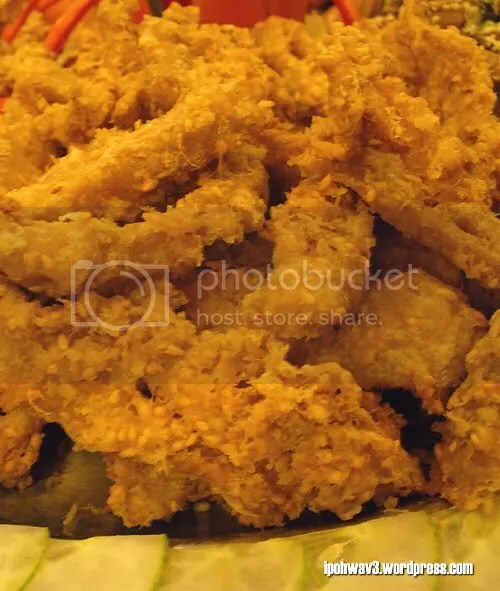 The pig’s intestines were battered with sprinkles of sesame seeds and deep fried. It’s a good stuff! Being the most picky eater among all of us as I don’t take internal organs, I find it extremely addictive. 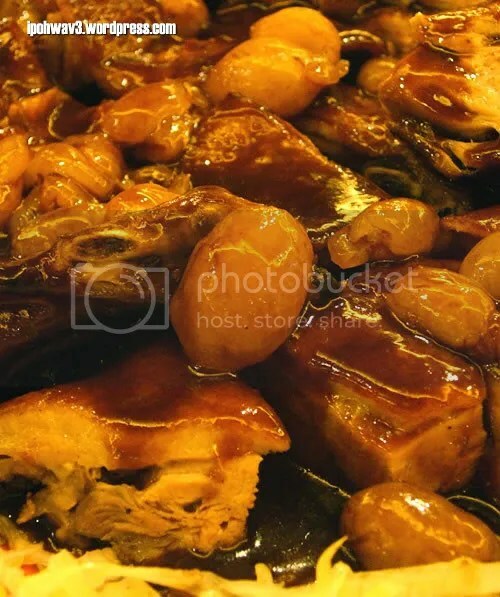 The intestines were cleansed thoroughly before cooked, thus there’s no unpleasant odour at all. Next on the platter was the Taiwanese Crunchy Popped Rice, served with Enoki Mushrooms and Shell Meat gravy. (Picture taken before they add the gravy on it). The rice blocks were very crunchy in texture and slightly sweetish in taste. 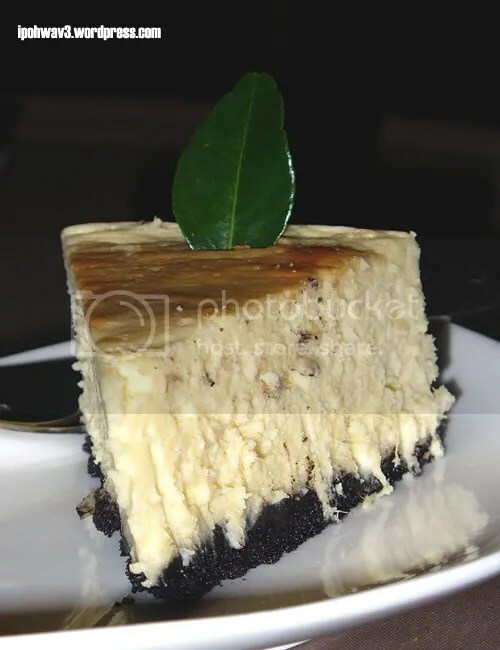 The gravy complements the rice perfectly – an interesting combination. We were also attracted to the Grilled Prawns Stuffed with Garlic, where the prawns were stuffed with minced garlic, skewered and then grilled. Although I’m not a fan of seafood, but again, I have a strong urge to try it and I’m glad I did! 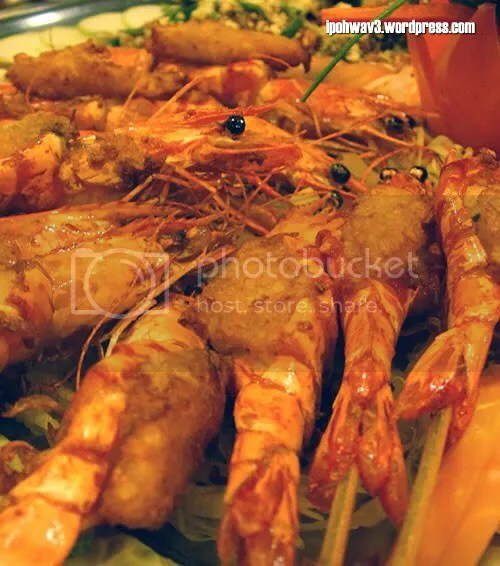 The prawn is fresh, juicy and bouncy in texture, while the garlic gave it an extra kick. Formosa Suckling Pig Set Meal: 2. Roasted Crispy Suckling Pig. 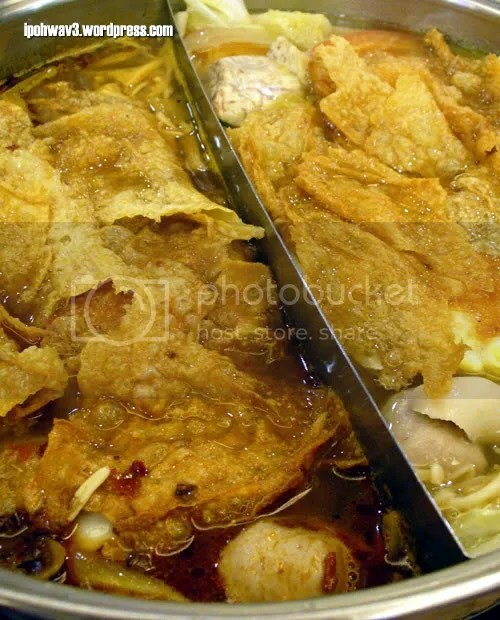 Believe me, it doesn’t look like one juvenile pig as the portion of this dish is sooo big! The skin is super crispy while the meat underneath it is so flavourful, it’s roasted to perfection. 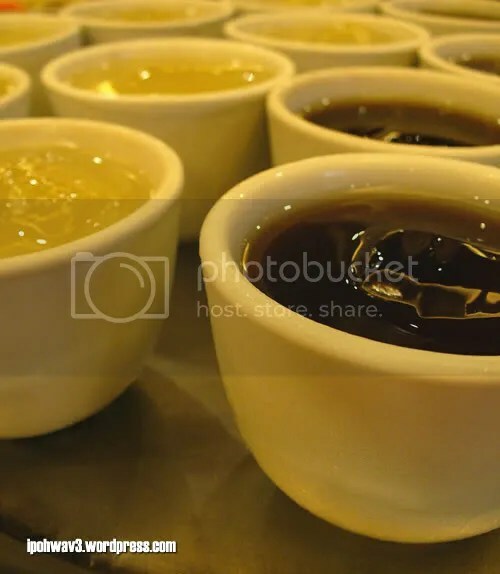 And while all these time we were used to dip the roasted meat into sour plum sauce, Jeannie teaches us to dip it into the vinegar which came along with the dish. According to her, you can actually reduce oil from the meat by dipping them into vinegar. Next, Formosa Suckling Pig Set Meal: 3. Two Varieties of Duck. 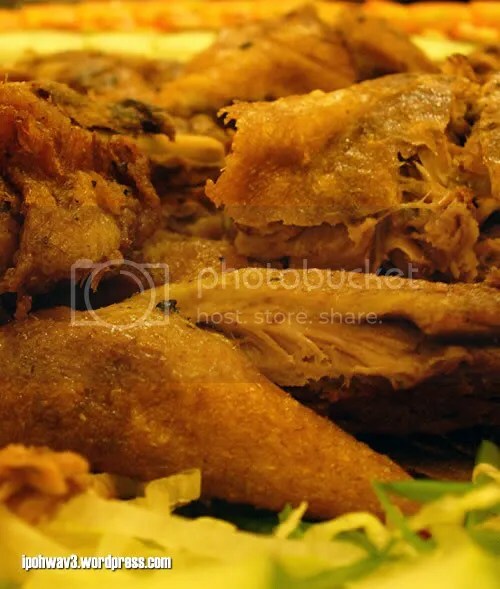 The first is the Sichuan Crispy Duck where the duck is marinated with special mixture of peppercorns, star anise, brown pepper powder, wine, ginger, scallion and salt and then steamed for two and a half hour till soft before it’s deep fried. The meat was cooked just nice, with a tingle of spiciness. The second one is the Roasted Pi-Pa Duck with Longan which rivals the Sichuan duck. The Pi-Pa duck is a bit on the sweet and savoury side, while I found that the meat is albeit tough for me. 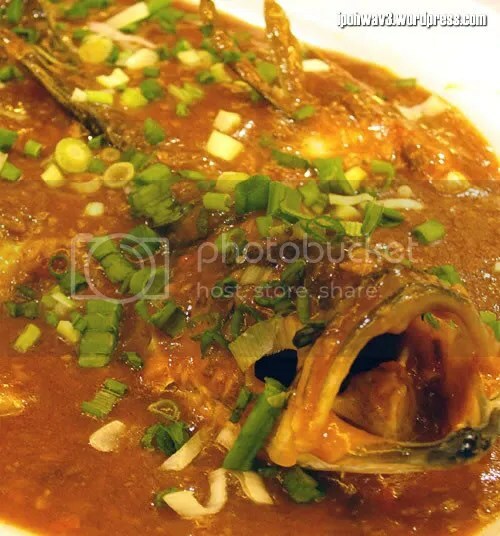 Steamed Fish with Taiwanese Fermented Bean Sauce, which turns out to be quite ordinary but the fish is surprisingly fresh and Formosan Special Fried Fish Slices. 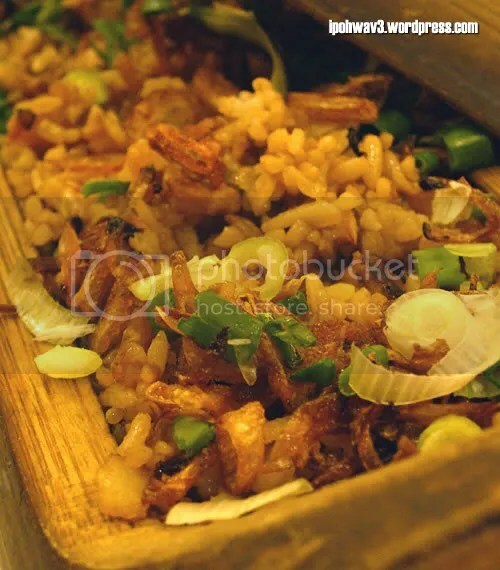 The last item in the Formosa Suckling Pig Set Meal, Formosan Yam Rice in Hollow Bamboo. 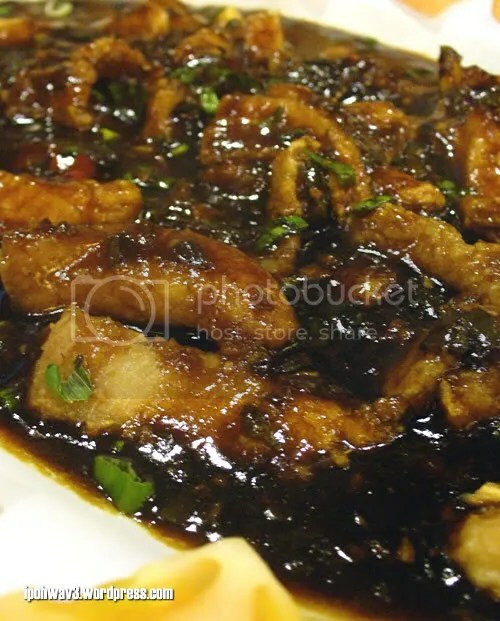 Cooked with yam cubes, dried shrimps, pumpkin cubes, shallots and spring onions, it tastes so good and was fast become one of the favourite dish among us that night. An additional item not in the set meal, some veggies to the rescue. 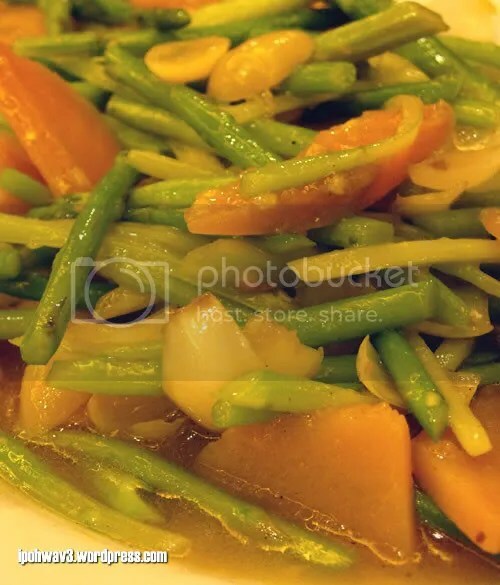 Stir-fry young asparagus with pumpkin slices, onions and lily bulbs. The two steamboats were served at the same time. The Formosan Stone-fire Pot is a bit unique. 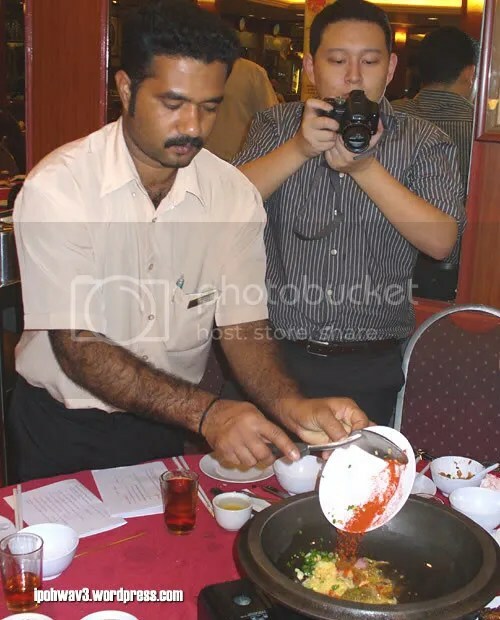 First, the waiter will sauté some garlic, onions, turmeric powder, curry powder and spring onions in the stone-pot. 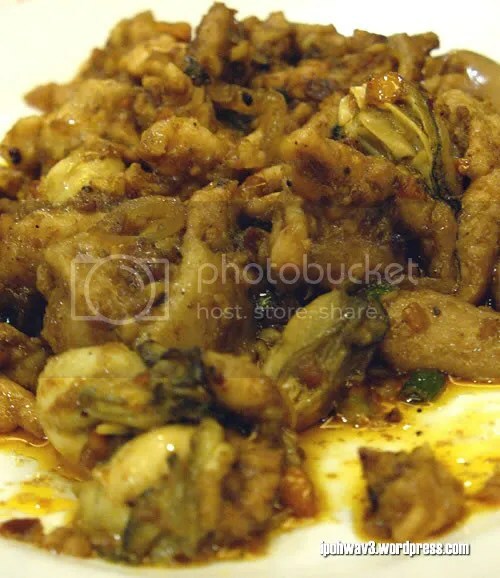 Chicken meat and big juicy oysters were added in later and cooked till the mixture is dry. The mixture is scooped onto a plate before adding in the broth into the stone-pot. 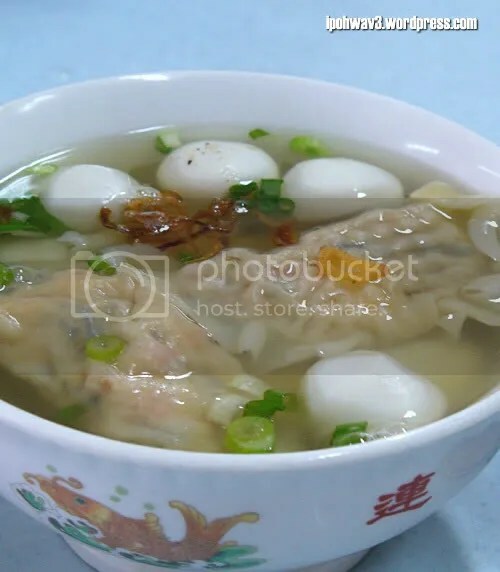 The broth is bring to boiled and ingredients such as beancurd, cabbage, enoki mushrooms, beancurd sheets and so on are then threw in and Taa-da, Formosan Stone-fire Pot! The sautéed chicken and oysters were just ok but there seems the oysters were not really fresh. We informed Jeannie about it, she apologised and immediately changed another set for us but we politely decline. While we were enjoying the Stone-fire Pot, the Bonito (Tuna flakes) and MaLa (Hot and spicy) Steamboat is also ready to be eaten. Brimming with plenty of ingredients in both mild and spicy broth, most of us prefer the bonito as the MaLa is too spicy for our tastebuds. And finally, it’s dessert time! 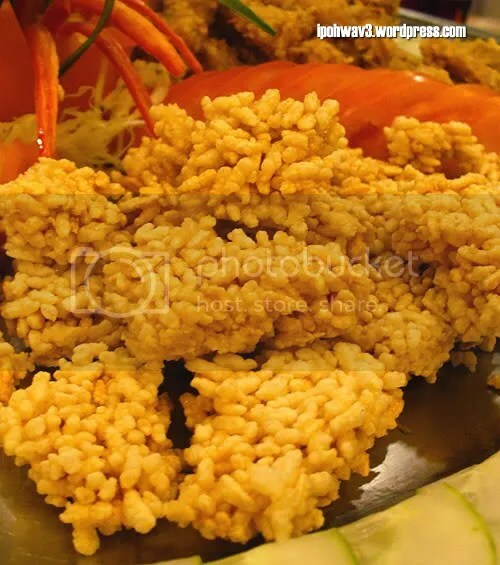 Hand Made Glutinous Rice Pieces with Grounded Peanuts. Also known as muachi, they came in assorted colours and of course, different flavours too. 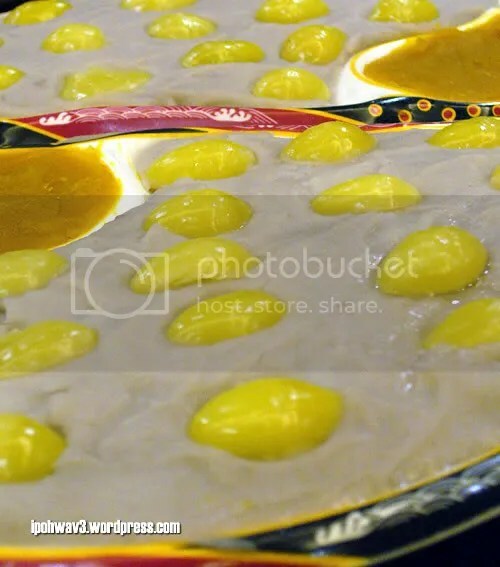 The authentic Ginkgo, Pumpkin and Yam Pudding or Orh-nee has our votes too. 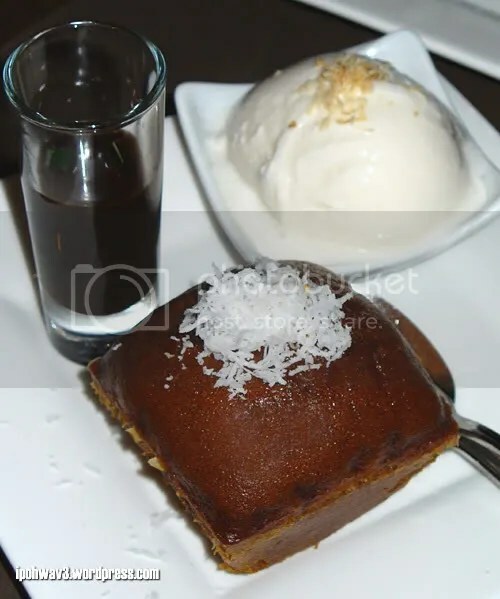 The grounded yam and pumpkin were really fine in texture and suitable for people who do not like sweet stuff. If you are to have this, do give them a call as this dish required to be ordered 1 hour in advance. 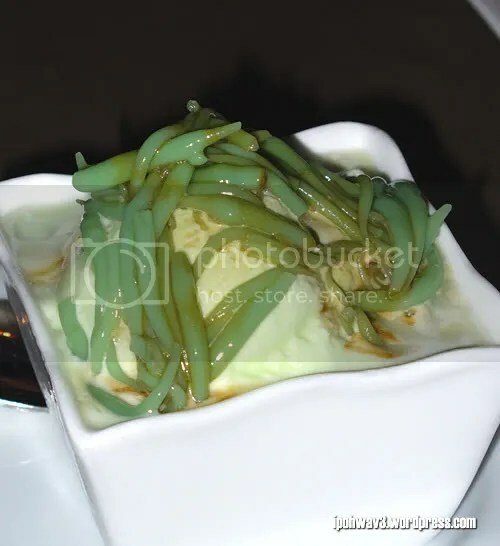 Another unique dessert, Formosa Special Sweet Yam. 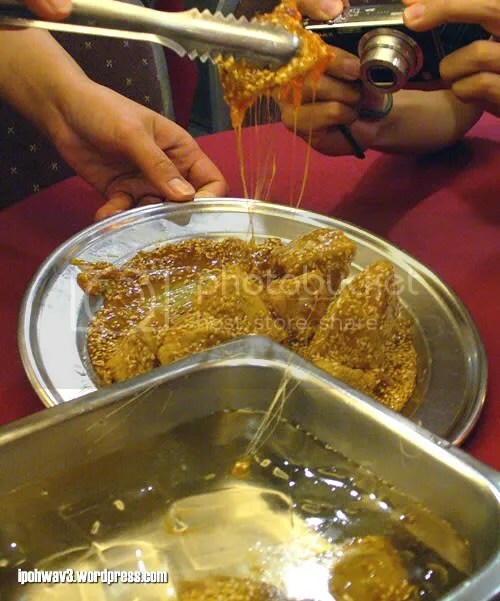 The yam cubes were first deep fried and coated with a layer of melted caramel with sesame seeds. The cubes were then transferred to a basin of ice water for the caramel to cool and harden. Interestingly, the yam cubes were not wet at all when taken out from the water and they’re still piping hot at the inside. Just one bite and we felt in love with it, completely. 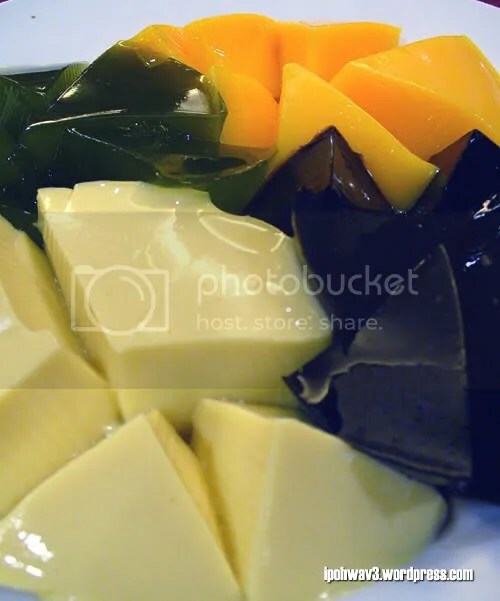 And finally, the four flavoured puddings of mango, green tea, custard and tortoise jelly. The green tea puddings are simply lovely. You can get these puddings from their dessert kiosks in Giant Shah Alam and Giant Subang Jaya. It was such a great dinner with great company and good service, we really enjoyed ourselves. Thanks again to Jeannie Lee and CityGal for organising the dinner. New Formosa also cater for wedding dinners, company functions and birthday dinners and in case you’re wondering, they’re open throughout the Chinese New Year celebration. 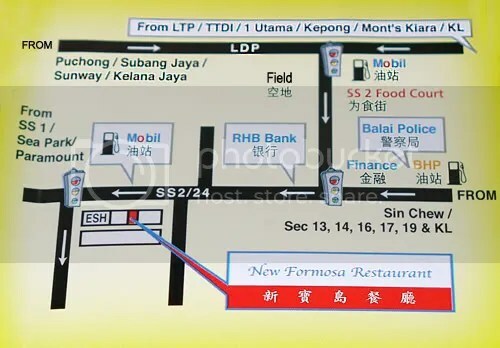 46, Jalan SS2/24, 47300 Petaling Jaya, Selangor. Business Hour: 12pm – 3pm and 6pm – 11pm. You Get What You Give… Sometimes…. 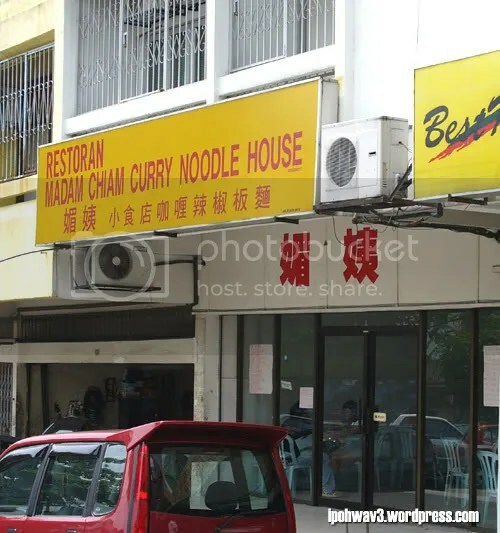 If you’re around the Cheras, Taman Connaught area and craving for noodles, do drop by Restoran Madam Chiam. 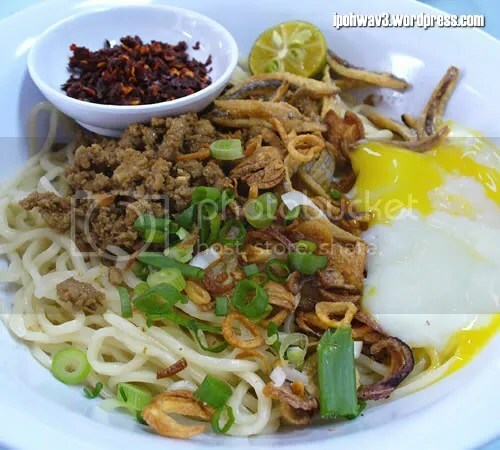 This particular restaurant serves only noodles such as traditional pan mee, chilli pan mee, curry noodles, wantan mee and the list goes on. The three of us (my boss, me and our friend 😛 ) ordered a bowl of mixed fish balls and home made sui kow. A good start as the fish balls were fresh and bouncy while the sui kow, filled with black fungus, fish paste and chopped turnips were firm and have just the right balance of flavour to it. The three of us went for their chilli pan mee, opting for the thin noodle which resembles wantan mee. Unlike the one you can get from Kin Kin, they do not have free flow of dry chilli flakes to go with the noodle. But of course, if you fancy for more fiery sensation, you can always request for extra chilli from the waitress. I would say that I prefer their chilli pan mee than Kin Kin’s, according to the serving size, taste and noodle’s texture. Kin Kin’s version is slightly saltier than Madam Chiam’s. 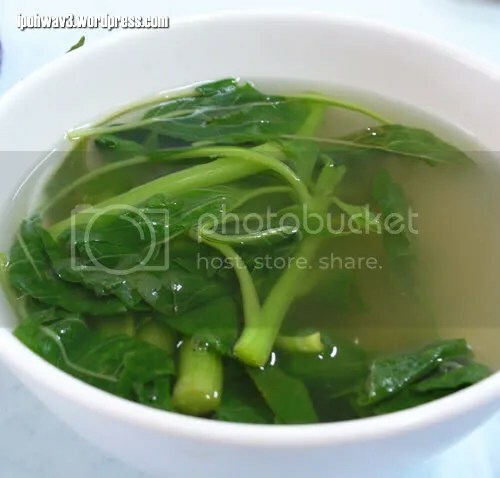 Instead of the normal soup with potato leaves, Madam Chiam’s pan mee came with spinach soup. I would say I prefer the usual potato leaves soup as the spinach were a bit hard to chew. Sometimes, I really wondered if I’ve gained any weight while all these time in KL. Why? Because while mingle with the floggers, food never seem ceased to exist. 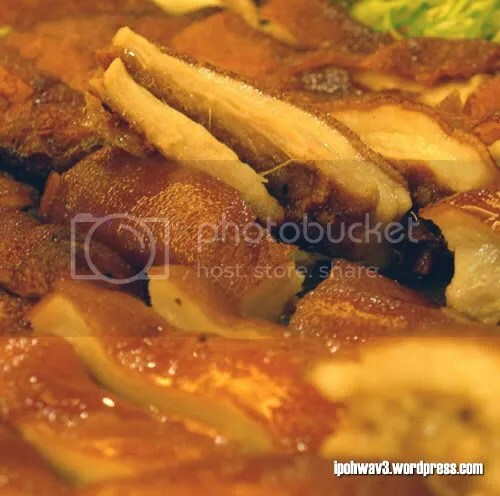 Despite all the food the floggers had at Pudu ‘Wai Sik Kai’ (exclude the Sek Yuen dinner which took place before this), there’s always extra space in the stomach, specially reserved for… dessert, of course! Before I could finish my ais kacang, I’ve already hearing the floggers mentioning about dessert on the other side of the table. 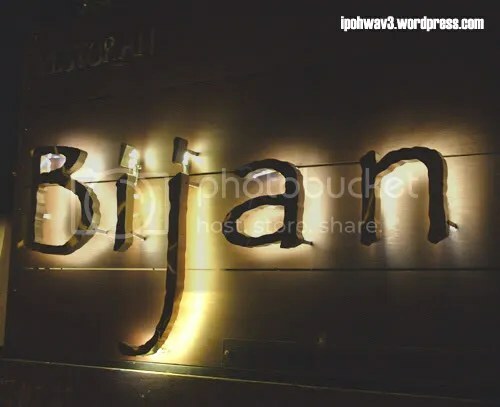 Discussions made and finally, most of us voted for Bijan instead of KTZ. 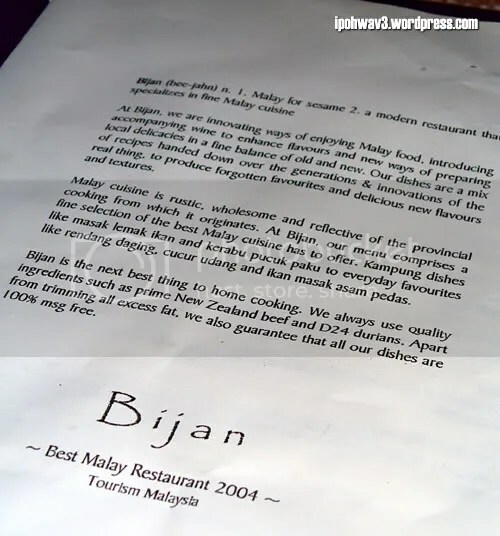 Located at Bukit Ceylon, Bijan is a Malay themed restaurant. We were actually mesmerised by the beautiful layout of the little restaurant, we can’t stop photographing it! One can actually have a very clear view of the Menara Kuala Lumpur (KL Tower) which serves as a backdrop for the restaurant. 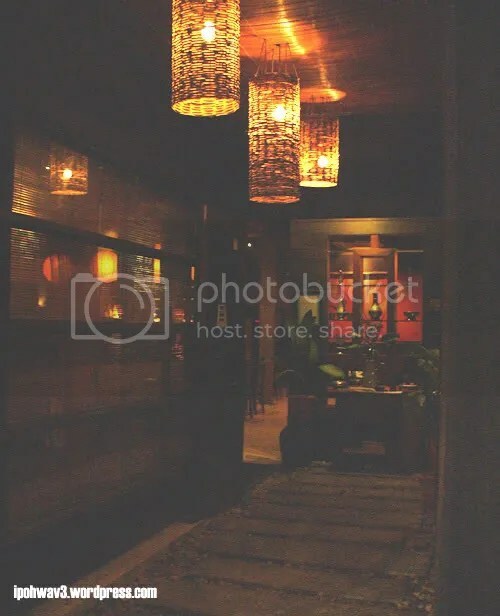 We were seated at the verandah, decorated with dim lantern-alike lamps, wooden furnitures plenty of greeneries and a small pond. How I wish that my house can be like this too! (Sorry, no photos of the surroundings as they turn out to be very dark). 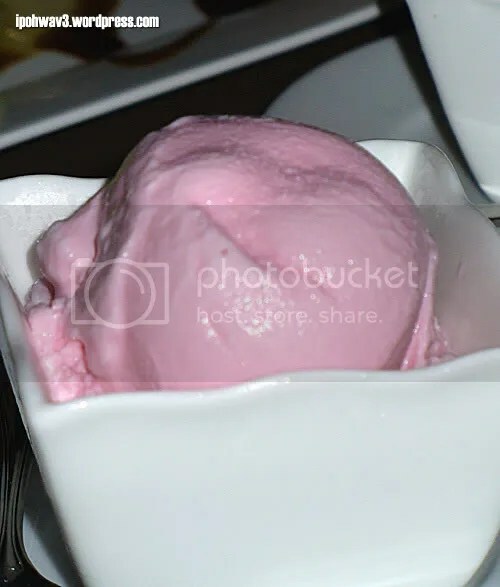 Next on the list, Bandung flavoured gelato which made the floggers go “Ummmmh…….”. 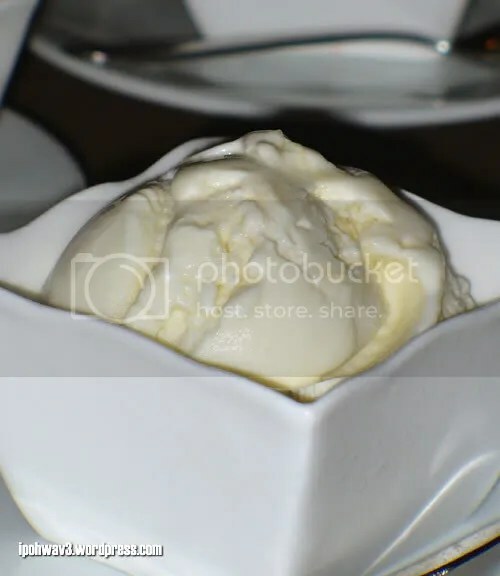 Vanilla Coconut gelato with cendol. Ummmmmmhh…. 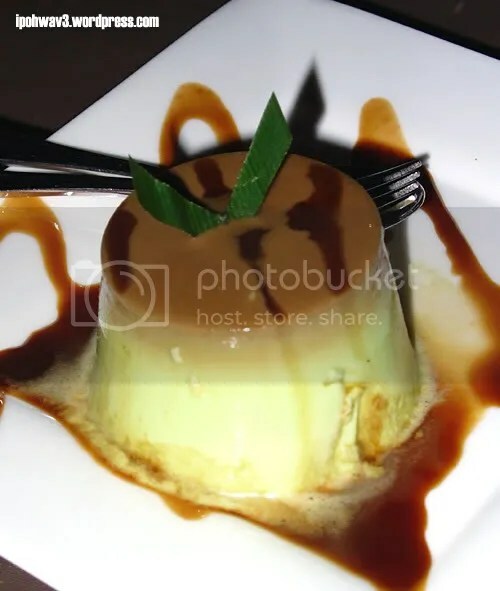 Next on the list was Pandan Caramel Pudding with Gula Melaka. 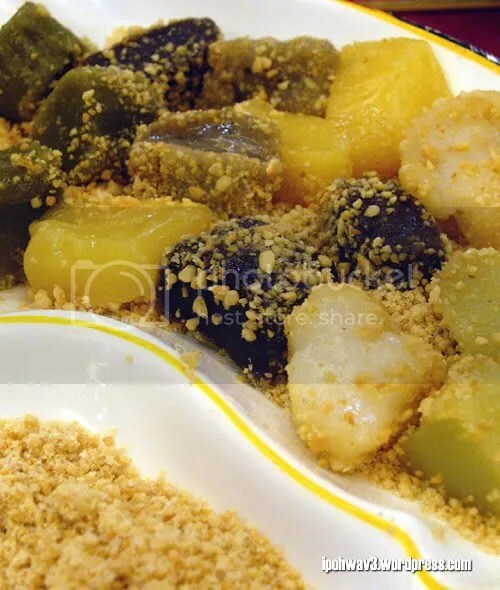 With just a nice balance of sweetness, the gula melaka pair perfectly with the smooth texture of the pudding. And that was another night filled with great company, great food and great laughter!